If you are looking for the best miter saw reviews on the internet, I think (humbly, of course) that you are in the right place. I hope to help you pick the right saw for your needs, and that is the reason why I created this ultimate miter saw buying guide. I aim to write detailed reviews and to reveal the top miter saw for the money. You can rest assured that if I think a product isn't worth buying, I will give it to you straight. With this buyers guide [updated for 2019], I will be sharing my in-depth reviews of Basic, Cordless, Compound and Sliding Compound miter saws. This specific Miter Saw is the most popular with our readers. This 12-inch miter saw is an excellent option for those who want a good balance between affordability and performance. A great option for those just buying their first mitre saw, while dependable and accurate enough for the job site. If you can find this for below $200, it is a steal! That is one great deal on a single-bevel compound miter saw! (check current price & read reviews here). ​Which miter saw is the best? The folks at Amazon also have their own list of best binoculars below – many are on sale. If you are looking for a comparison, or perhaps a specific size miter saw, these buttons below will help you find the best saw for your money. You can also this table of contents to find the right saw for you. What Type of Miter Saw To Buy? There are a few different ways you can use my guide. 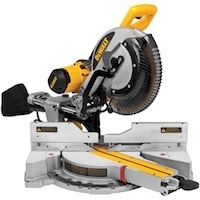 If you are in a hurry, I recommend you check out the comparison table for a brief overview of the 5 top-rated miter saws on the market in 2019 (most of these models were bestsellers in 2016 as well). If you want to read up on each model, use the Table of Contents above this paragraph you can use the quick link to go to the relevant review. 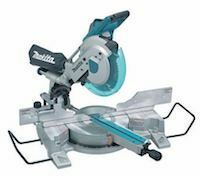 Alternatively, you can read my individual review of the top-rated miter saw you are interested in. All the reviews were written by myself. I have plenty of experience with miter saws over the past 11 years, and I hope that my review and buyers guide will help you purchase the right equipment. Before I consider recommending a specific product, I make sure that other consumers are happy with the miter saw. I do this by scouring the web for consumer reports, user reviews, ratings and comments. If I see too many complaints about a specific product, I won't even mention it on the site. There won't be any doubt that the very accurate Festool Kapex KS 120 is the best 10 inch miter saw. It has been the number 1 for a while, and it probably will remain the best-rated sliding compound miter saw for a number of years. While the competition for the best 12 inch miter saw is more fierce than for the smaller saws, the high capacity Dewalt DWS780 is my favourite. The double bevel siding functionality enables cuts up to 16 inches which is a good deal more than other 12 inchers. Durable and precise, this 56lbs Dewalt comes with a powerful motor. A handy and super bright LED light makes for easy alignment, and in my experience this light works better than most lasers found on other models. This 10 inch miter saw is by far the best commercial grade miter saw in my opinion, and if you have a shop, this is the unit for you. If you need a miter saw for crown molding, look no further than the Dewalt DW716. This double bevel compound miter saw features a cam-lock handle that is easy to adjust, and the tall fence is ideal for those oversized decorative moldings. You can check out my Dewalt DW 716 review here​. I like the versatile Dewalt DW709 for the homeowner or the DIY hobbyist. Why you might ask? I have always believed that picking any sort of tool as a homeowner or a DIY hobbyist, is a much more difficult decision than for the shopowner. The shopowner uses his tools to turn a profit, and those profits can be used to purchase more tools for specific uses. 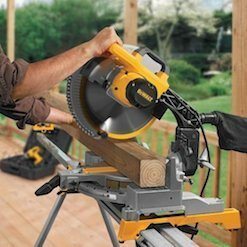 A homeowner probably won't purchase more than one miter saw, and this is why I believe the 13 positive stops, the 50°/ 60° miter saw angle combined with the compact, portable design makes this a great option. When it comes to using a miter saw for making picture frames or fine woodworking, I really like the accurate Makita LS1016L. I like how solid the hinging feels, and the easy alignment ensures that I always have a accurate 45° cut. Those accurate cuts make for great looking corners without a gap, but let's be honest. For picture framing you will probably be better off with a Morso Mitre Guiollotine, but those come at a much larger price tag than the LS1016L. For fine woodworking, the 52°/ 60° miter angle comes in handy, while the built-in laser and the 6 linear ball bearings ensure that your cuts are very accurate. If you are looking a good miter saw for $200 or less, the Makita LS1040L is the <em>best of an average bunch</em>. Beware, you get what you pay for though. While I like many of Makita's offerings (see my LS1216L review), I feel like the LS1040L is really only suitable for those DIY'ers that will use their miter saw once or twice a year. If you plan on using the miter saw more often, I have to urge you to go for the DW716 instead. It costs about 1.5 times as much as the LS1040L, but you will get much better results from it. If you simply cannot afford a penny more than $200, the 4600RPM engine does a good job, and while the 45°/52° might limit more serious woodworkers, it is sufficient for the casual weekend DIY'er. Before you start reading my reviews, you have to know what you want to use the saw for. One of the biggest factors is the types of material you will be working with. Another determining factor is how much work you plan to do on the miter saw. Cross Cut: the typical cut which involves cutting your material to length, just like you would with a regular saw. Miter Cut: this type of cut is angled across the width of the material you are working with. Bevel Cut: this is an angled cut that goes through the thickness of the material. Compound Cut: this one is a combination of a miter and bevel cut. Basically, it’s a cut that is angled across both the width and the thickness of your material, at the same time. Standard miter saws: this type of saw comes with a blade with a fixed pivot, meaning it remains vertical at all times, except for when you horizontally angle the table. Compound miter saws: this saw allows the pivot to be rotated vertically (to one side), which – in additional to the horizontal rotation of the table – allows you to cut in both the horizontal and vertical planes. Sliding compound miter saws: similar to the regular compound miter saw, with additional arms for the cutter head which can slide horizontally, making for easy cuts in wide materials. Dual compound miter saws: same as above, however the motor &amp; blade can be tilted either right or left. An excellent choice for very complicated projects where many different cutting angles are needed. More about dual’s further below. Learn which type to choose between sliding and compound miter saws. Different tools have different capacities, and whichever you choose make sure that it is enough for the type of work you’ll be doing. The capacity can be determined by taking a look at the miter saw blade’s sliding capabilities as well as diameter. Will you be working only with smaller “amateur” projects, such as wooden frames, small house models and such? If so, then a 10″ miter saw will offer you more than enough capacity. Are you a professional woodworker who constantly works with larger projects, such as roofing elements, pillars, and such? If so, then you’ll benefit greatly from having a 12″ diameter blade. Of course, there are miter saws with an even smaller blade diameter available (as small as 5″), however we do not recommend those as while they are a great choice for very small projects, you will likely find your cutting needs expanding soon enough, in which case you’ll have to make a switch to a 10″ blade or larger fairly quickly. A good option for those who need to be more mobile with their mobile saw, it is important to keep in mind that a miter saw uses alot of energy during operation. This means that even the best cordless miter saws are unlikely to last more than a couple of hours on a single charge. While having the option to go cordless is definitely a nice to have, you will have to consider buying battery packs if you need to work cordless all day long. Depending on the product, the battery packs are usually 18V or 24V. Another option is to go for a miter saw with a lithium-ion battery, though these tend to be more expensive. Sliding Fence: a fence that can be moved out of the way easily to allow for bevel cuts to be made. Dust Port: this port allows you to hook a vacuum andor dust bag to your miter saw, collecting a large portion of the dust that comes from your cuts. Extra Miter Cut Range: a number of models allow blade tilt of more than 60 degrees. Check our reviews to ensure if the model you are looking at, can handle this extra cut range. Laser Guidance: while laser alignment aids was all the rage over the last few years, there are those that do not like them. Using it in the right manner can aid in the alignment ensuring accurate cuts. Most units come with a single laser that shows you where the cut will be made, while dual laser models show the width of the cut (kerf) as well. Handle Adjustment: this allows you to change the handle's tilt and position. Electric STOP System: not a function that I recommend you use too often, as it adds wear and tear to your saw, but it is handy if you are in a hurry and need to stop the blade quickly. It has saved me a good deal of time in the past, as it can bring the blade from spinning to completely stopped in as little as 3 seconds. As you well know, miter saws are coming out with new and improved features every year, but the ones listed above are the most important ones when it comes to picking a good miter saw.